At Green Drinks we are looking at a map. It's no ordinary map of roads and houses and municipal buildings. 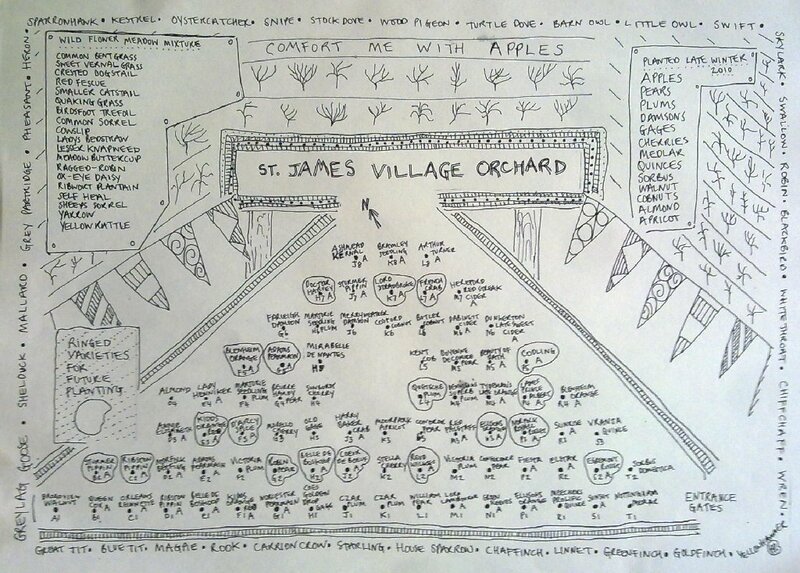 It's a map of a community orchard, showing 100 fruit trees - apple, pear, quince, plum, cherry, damson, medlar - that were planted two years ago in the village of St James in Suffolk. Rob Parfitt who helped create the orchard is describing how a group rented the land (originally an over-grazed part of the common) and planted the trees, set around a restored shepherd hut which serves as an information centre and informal gathering space. The hardest thing, he said, was not the thistles in the ground, or raising the funds, but persuading the village to agree. "People will just go in and take the fruit!" someone objected. "That's the idea," he replied. Last year, before one of our films held in the neighbouring village, some of Sustainable Bungay went and visited the newly planted site. 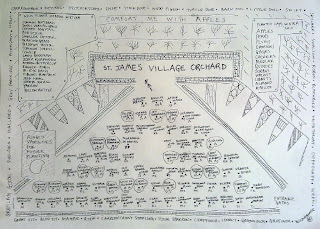 Originally Rob said, the inspiration for a Village Orchard was romantic and Arcadian. Their choices for fruit were based on childhood memories and varieties that were locally known. The group had not thought about the future - who would look after it, or who the fruit might be for. Since coming into contact with Transition (Christine, his wife, is one of our Happy Mondays cooks), he was looking at the trees in a different light. In terms of local resilience. Most of the trees had been planted on dwarf stock, as the village had wanted "to see results", but some had been planted on M25s. Who knows who might benefit when those great fruit and nut bearers have reached their prime? Behind us in the back room there is a tray of unknown apples, recently collected from a local school (who had no use for them) by Roger, Cathy and Nick. After the meeting we will all take some home. It's part of our Abundance project, which regularly redistributes produce at our events and at a table at our Happy Mondays community meals, and at the Library Community garden. 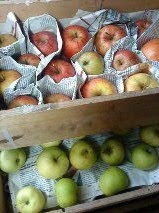 As Apple Day (October 21) approaches, now is the time to start storing apples up for the winter. My own larder now has trays of scrumped, foraged, roadside stall and Abundance apples stacked beneath the shelves, perfuming the kitchen. 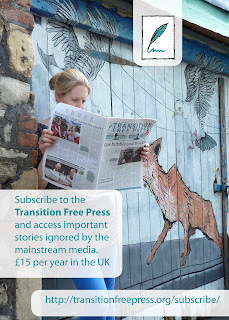 One of the first things that sparks the imagination in Transition is its practical and poetic reconnection with neighbourhood trees, planting fruit and nut trees in urban spaces and holding apple pressing events. Abundance gathering and redistribution projects, large and small, have been cropping up all over the country. There is a huge inertia about collecting and gathering our native fruit and these enterprises help galvanise interest and connect us with our native roots. Industrialised to the max, we would rather buy apples flown in from New Zealand in a plastic bag from a supermarket than make good use of the fruit lying freely all about us. At Green Drinks Eloise told us that at her local primary school the School Council (made up of pupils) voted against planting fruit trees around the playground "because of wasps" (so much for education improving your intelligence!). Eloise who organises a team of "eco warriors" at the school has said the team are going to change their minds! by George Thorley, Elder Class, Norwich Steiner School. Norwich abundance is an urban fruit harvest project. Abundance began in Sheffield in 2007 finding all unused fruit trees and sharing the fruit with the public. This was to help show that fruit is being wasted each year and left to rot. The new upper school of Norwich Steiner school recognised that they wanted to make people aware of the vast amount of fruit produce that is being wasted every day in the UK and other countries. There are lots of fruits being imported from New Zealand and other countries with a large carbon footprint, instead of using our seasonal glut of local fruit. Norwich Steiner school upper school students, during September and October, are picking unwanted fruit and then this will be distributed to people who may not have access to fresh fruit. With any extra “fruit” we are making jams, chutneys, juices, and more. Alys Mendus, our teacher and project leader, said “We’re giving away the good apples then making the bruised ones into chutney and juice, that will be sold." “The money that we make is going to fund the project, and any profit is going into our class and the school,” said class member Barnaby Taylor. 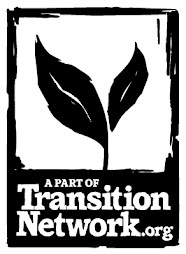 We are working with Transition Norwich who have been recording where fruit trees are. So we can help them map out fruit trees as well as picking fruit. Our class has created posters and these have been emailed to parents and others who are in the school mailing list. We have also made a flier that will be distributed to people in the local area and some shops in Norwich. Get in touch with the school if you are willing to help us in this quest. Or if you have trees or know of any where the fruit needs picking, or if you have any queries get in touch with us. Those people who offer us their fruit will get them picked for free, then, we will offer them some of the fruit and take the rest for processing and distribution. So please get in touch if you are interested, and help us start picking!